St. Patrick’s Day week is one of my favorite weeks of the year, for obvious reasons. Not only do I usually have a handful of gigs to play at but usually some of the finest Irish musicians come out of the woodwork to share their craft. This year is no different. 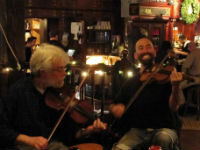 7:00 pm – Burlington based Irish band Extra Stout at Contois Auditorium in Burlington. There are tons of other activities and music happenings on and around St. Paddy’s Day so enjoy the music and have a Happy St. Patrick’s Day!